The Chaplain is The Reverend Graham Stevenson. In addition to welcoming people to Chapel services, Graham is keen to offer friendly support to all College members, regardless of faith, and to work with other pastoral care providers in College to help those facing particular difficulties. Graham is in College on weekdays excluding Thursday and in Chapel at services on Sunday. Please feel free to drop in to his study, K11b, or phone or email to arrange a time to meet up. Graham originally trained with TeachFirst as a Science teacher after reading Biochemistry at Oxford. Teaching was followed by a year living in Tunisia and then ordination training at St Mellitus College. 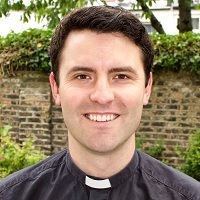 Graham extended his training with an MA in Biblical Studies at King's College London before going on to his curacy leading a church in Hackney which served a diverse and deprived parish. Most major faith communities maintain chaplaincies to students in Cambridge. The contact details of a number of chaplains to the University are listed below. For details of others, please contact the College Chaplain. Christian Union (see CICCU) meets each week in College for Bible study, worship and prayer. All are most welcome. For more details, please contact the CU reps Ben Bristow and Nathan McStay. Fisher House, the Roman Catholic Chaplaincy located in the centre of Cambridge is very active and offers services and activities for all who are interested. For more information, contact the Fisher House Chaplain: chaplain@fisherhouse.org.uk or the Fitz Fisher House Rep, Fabio Fiorelli. Methsoc meets weekly at Wesley Methodist Church. Visit www.meth.soc.ucam.org for more information. Fitz CU, which meets on Mondays at 7pm in the Stretton Room. Contact the CU reps listed for more information.